Emil Lee, Minister of public health, social development, and Labor said that the war against mosquitoes is multi-faceted, and that as of September 9 2016, 54 Zika cases have been confirmed on the Dutch side. The collective Prevention Services has been tirelessly repeating the message to the public on how to prevent mosquito breeding areas. “The collective Prevention Services (CPS) has been going out together with volunteers to various neighborhoods, and it’s disturbing to see that we keep on finding many of the same problems. For example , we found some cistern overflows unscreened, multiple water collection spots like empty bottles, and yards with many tires, all of which are perfect breeding grounds for mosquitos” said the Minister. He further informed that that citizens who are active and report active breeding sites are an important part of the war against mosquitoes. The Ministry of VSA has been creating a map that shows incidents of where zika is being discovered, as well as trying to track mosquito populations for a better idea of where resources need to be allocated said the Minister. 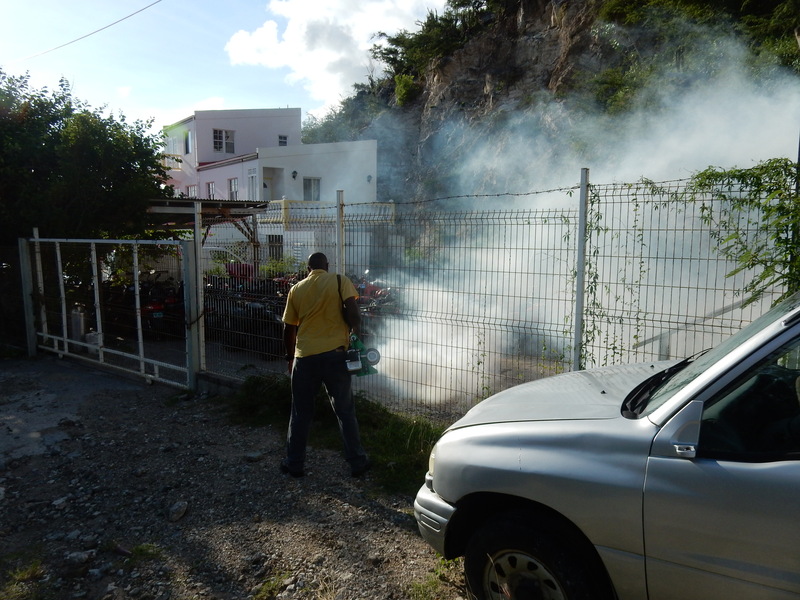 “When the Ministry receives information from citizens regarding active mosquito sites, that’s when they go and do targeted fogging in the area which was reported. It is important that the public understands that blanket fogging across the island is not the ideal situation. Blanket fogging kills mosquitos, but it also kills all other kinds of beneficial insects as well. It also creates mosquitoes that build up resistance to the insecticide so that future control efforts become less effective. These were just a few reasons why the Ministry opted for targeted fogging rather than blanket fogging “explained the Minister. Residents are urged to keep their yards clean, and get rid of any debris that can be a potential breeding ground for mosquitoes. Also, residents are urged to report any active breeding sites to the Collective Prevention Services (CPS) by calling 542-3003.